To truly be appreciated and accepted into a community, there has to be a level of understanding about what and who is needing to be served. 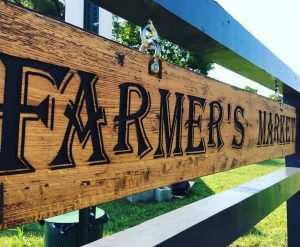 Virginia’s Broadway Farmers Market has been in the mix serving its local customer based for over ten years. A lot has changed over that course of time, be it location or vendors, but what has remained constant is what is at the heart of their market. CeCe Dodd, market manager, is just one witness and participant of the passion that flows beneath the scenes. Beneath airy tents, among fresh displays, and within the market atmosphere, she finds a place where quality of product commingles with quality time spent. We are happy to hand over the Instagram reins to the Broadway Farmers Market these next two weeks- a place serving up plenty for the (local) soul. CeCe Dodd: Our Market began March 30, 2002 coordinated by the Broadway Hometown Partnership as an open-air, seasonal market with about 15 vendors. While locations changed three times in ten years, the Market’s ideals and community spirit have kept both vendors and customers active. For the first ten years the market was run by volunteer managers. Since 2012 it has been run by a paid market manager. We currently have a dedicated location with plans to build a permanent structure/weather shelter. We have had 25 vendors consistently for the past two years. Vendors must produce their product within 50 miles of the Market, and re-selling is limited. We try to vary the products sold and manage the amount of vendors for a particular product to meet the demand from customers. We are always inspired by families of farmers who raise their children to help on the farm, in the production of the product, and involve them in selling at the market. We have watched several “Market Babies” grow with us over the years! CD: We are an outdoor seasonal rural market located within the town of Broadway, Virginia (population 3,200), open Wednesday afternoons and Saturday mornings, from the first Saturday in May through the first Saturday in November. We are located in Veteran’s Memorial Park, with a grassy area for yard-games, and picnic tables for enjoying a hot breakfast or lunch with us. We are a family and community oriented market where the vendors are all family and the neighborly vibe brings repeat customers every week. Come to shop for food, crafts, gifts and unique local items – stay for the friends and have lunch with family! CD: We are proud acceptors of SNAP EBT benefits. We host 4 major Market events each season (Mother’s Day weekend/Opening Day, Kid’s Day, Dog Days, Trick-AND-Treat – each with theme-specific demonstrations, activities and contests), and participate in local festivals (Autumn Days Craft Show) and holiday events (Homecoming Parade, Holiday Market with the local school PTA). The Market loves hosting local musical talent, both plugged and un-plugged, and has begun a volunteer program to help increase the activities and demonstrations provided all season long. FMC: How do you guys participate in the local and holiday events that you mentioned? CD: During the Autumn Days festival, all of the Market vendors move from our existing location to the entrance of the main festival. This gives us a great deal of exposure, and allows the craft vendors to participate in the festival without “abandoning” their market family for the day! We try to incorporate holiday themes when possible -such as trick-or-treating and encouraging the wearing of Halloween costumes. Our opening weekend is always the weekend of Mother’s Day-so our vendors try to highlight gift ideas. CD: The BFM has bolstered its brand through social media, adding a Pinterest feed and Instagram to the social lineup in the past two years. We have relied on Facebook and Twitter since about 2006/7 – and have found the e-newsletter to be a big draw for customer attendance, especially with large events. We always hang large banners over the market park when the season opens, and have tried yard signs throughout the community. We use newspaper ads and radio spots for event days, free CSAs and TV spots like the local weather “weekend picks”; we have rack cards all season long, and postcard style “invitations” for the major event days. We hang posters and flyers at the post office, library, town office, and local eateries. We are part of the downtown Main Street businesses, and try to be involved as much as possible with other business events like Broadway Retail Day and Shop Local weekends. For other markets I recommend total market coverage – don’t limit to one type of feed – as much as you budget will allow, utilize them all to draw all generations. FMC: What do you guys post on Pintrest? CD: Recipes focusing on fresh, seasonal ingredients. Ideas and information on growing a backyard garden, raising chickens, putting up food, homesteading, handcrafting…and resources for vending at a market. FMC: In a nut shell, what is at the heart of the Broadway Farmers Market? CD: We are a Hometown Market – the place you go for your Saturday morning donut and coffee…where you bring the whole family for the week’s produce shopping…where you bring your out-of-town guests for a picnic lunch…and where you find that one-of-a-kind gift with a story behind how it was made and who created it. The heart of our market is that everything you purchase was made with love. CD: Moving to our new location in 2012 was a huge challenge, as at the same time we changed management. Getting the word out to customers about the location change was not prompt and caused us to lose customers that year. Vendor retention has also been a challenge – our vendors start with us to “test the market” for their product. If they do too well, they inevitably move on to larger markets! We are ecstatic for their success, but always sad to see them go! We have celebrated the success of doubling (if not tripling) our customer base in the past year. Expanding our customer reach to neighboring towns, reminding them that we are just a “hop, skip and a jump” away – usually less than a 15 minute drive – and promoting the kids and dog days events, has brought people in from surrounding areas whom we hadn’t reached before. Of course we are always grateful to our dedicated town customers who are able to walk or bike to the market for their weekly shopping! FMC: What factors contributed to the doubling/tripling of the market customer base? CD: Marketing! Definitely the introduction of a weekly customer email. We also increased the frequency of Facebook posts and focused newspaper advertising around special events. We added three special events to our season, and brought in occasional live music. Having hot food options for breakfast and lunch, and providing several picnic tables encouraged people to shop and eat at the market. FMC: What do you think keeps loyal market customers coming back? CD: I’ve heard that we are friendly, fun and “chill”. We don’t have huge crowds to fight through, but you are sure to run into friends while at the market!